With 28,000 square feet of concrete, there is plenty of room for skateboarders of all ages and abilities. We have ½ pipes, rails, ledges, banks and a 9 and half foot (6 foot shallow end) kidney shaped pool to challenge even the most experienced skater. Skatepark Rules and Hours. The Little Dudes Park is for beginning skaters and those under the age of 12 to hone their skills with a learning area for beginners and young skaters. 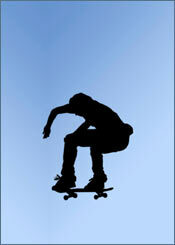 For more skate park information call (904) 209-0333.